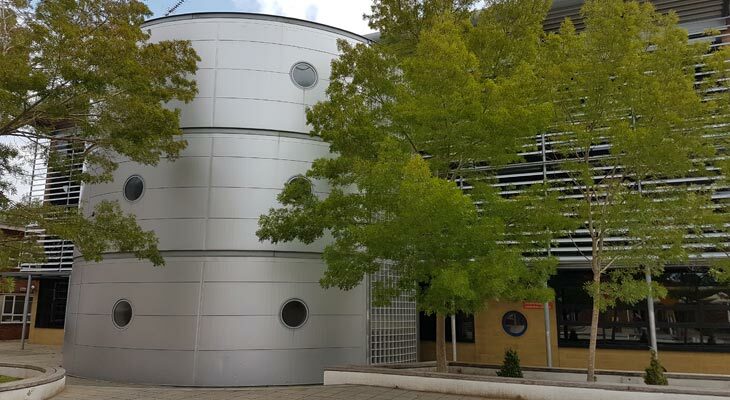 Euro-Pean Flooring in Horsham was contracted to supply and install 600 square metres of library flooring in Godalming, Surrey. The existing carpet was worn and failing in places (and so was the underlying latex) so a decision was made to replace everything. 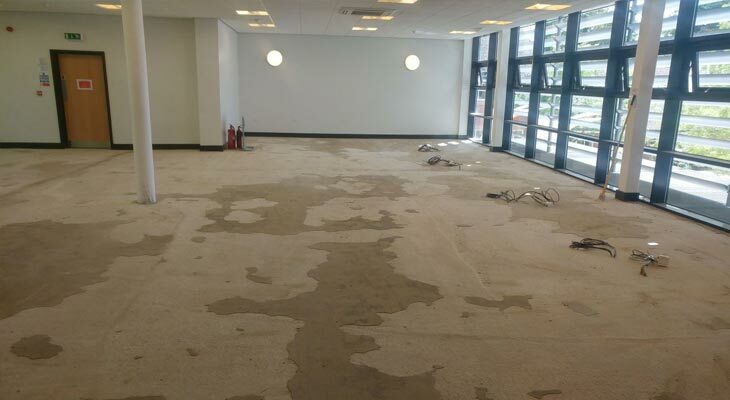 We installed a new latex layer onto a specialist primer for absorbent surfaces, and we then installed a flotex carpet with cushioning and acoustic properties to the client’s specification. 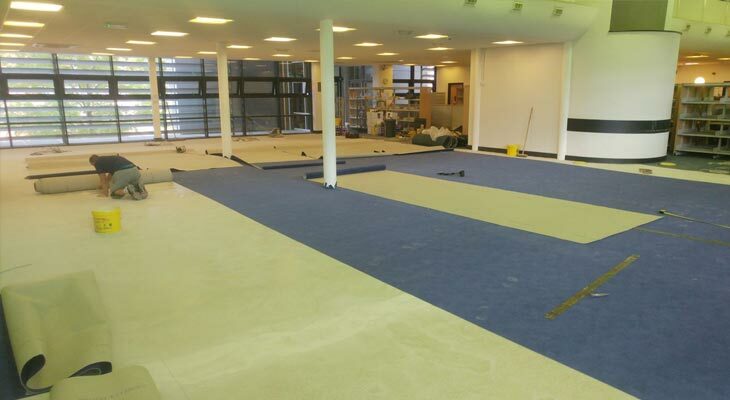 Overall the library flooring works took less than two weeks to complete, utilising up to five of our carpet flooring experts at certain times during the process. 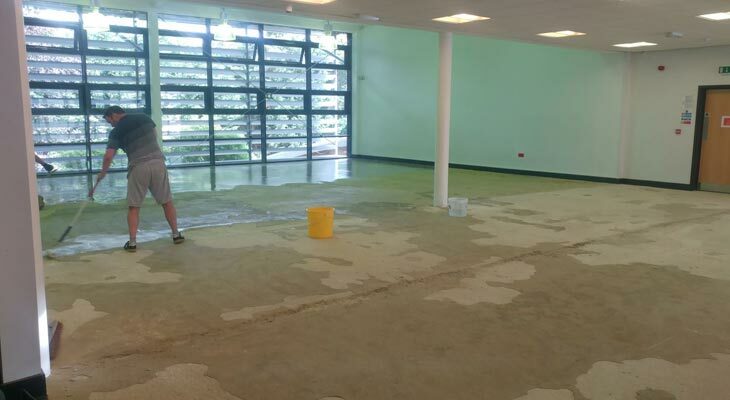 View photos below from the Godalming library flooring installation and if you require help with your commercial flooring projects then please contact us at Euro-Pean Flooring in Horsham. Exterior view of the Godalming building that housed the library. 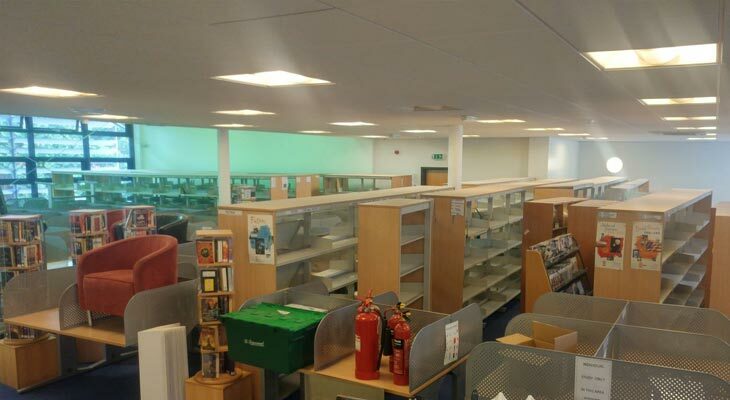 The main obstacle was to fit the library flooring in and around all the desks, shelving and 33,000 books without clearing the room. So we decided to tackle the installation in two halves, by moving everything to one side and running through the entire fitting process on the now empty half, then moving everything over to the completed half and repeating. 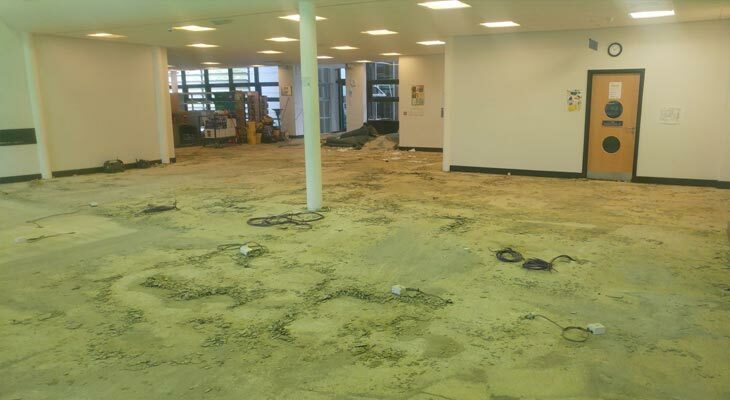 Most of the underlying latex layer was brought up in small fragments when pulling up the library carpet, essentially ruining the underfloor layer. The previous latex contractor hadn’t primed the floor so there was no bond strength. 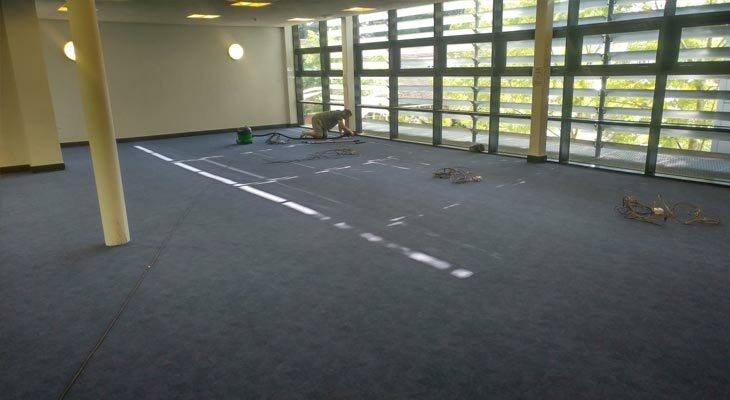 A view of the old library carpet ready for removal. The grey backing is the old blown latex still stuck to the carpet. 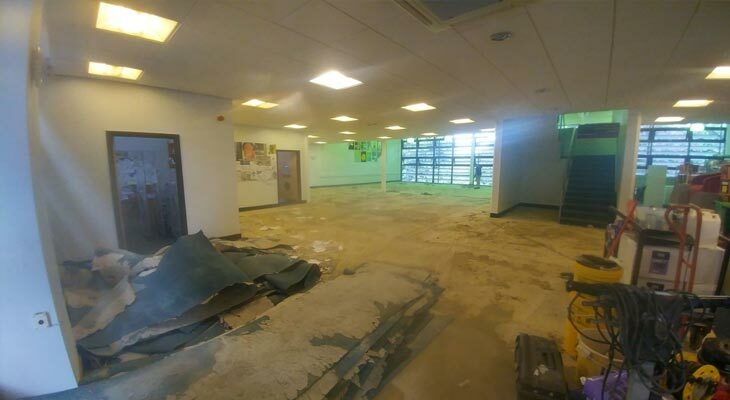 Our Horsham flooring experts chipped away and hacked up the remaining failed latex using a mechanical chisel, and then swept up the old loose fragments. Any outstanding sections of old latex that were incredibly well bonded were left as latex on latex is compatible. One of our Euro-Pean Flooring sub-floor specialists installing a new latex layer onto a specialist primer for absorbent surfaces. 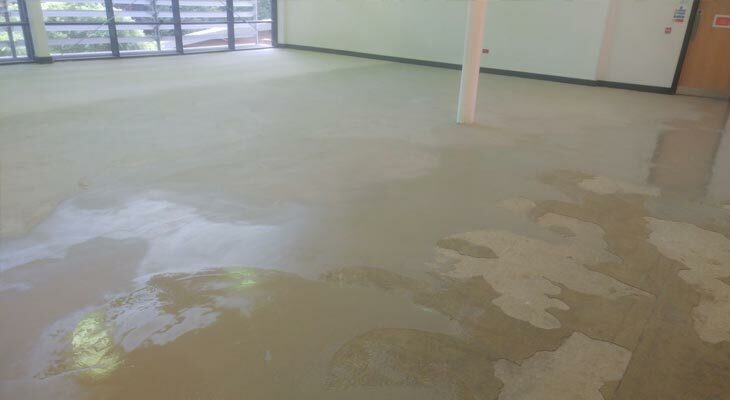 The primer soaks into the floor to aid the bonding between the latex and the existing floor. 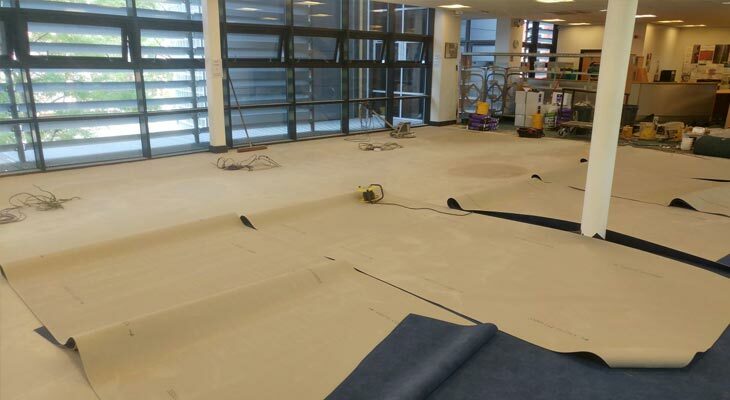 View of the new perfect latex layer being applied to the library flooring in Godalming. 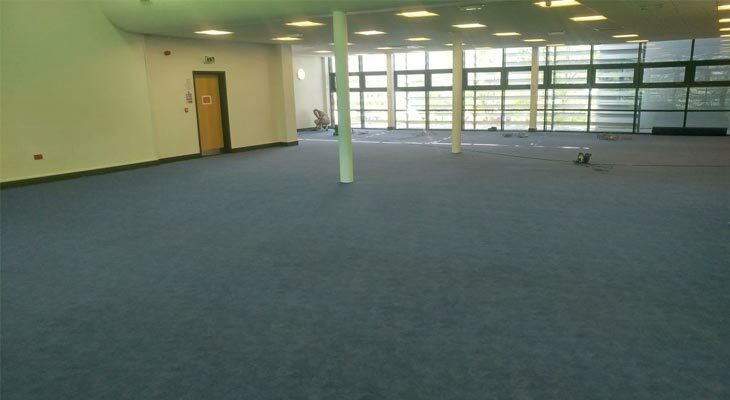 With the new latex installation completed, the next stage was to install the super hard wearing, stain resistant and easy to clean, blue flotex carpet with cushioning and acoustic properties to the client’s specification (excellent flooring for a library environment). 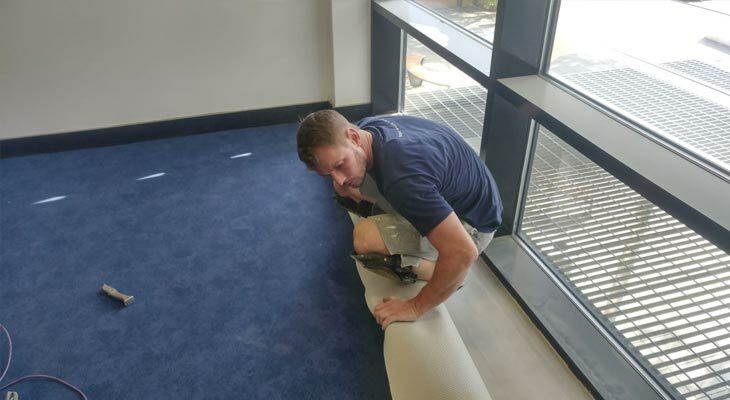 One of our specialist commercial carpet installers gluing out in front of the roll, then rolling the carpet into the wet adhesive (each time in small manageable sections). 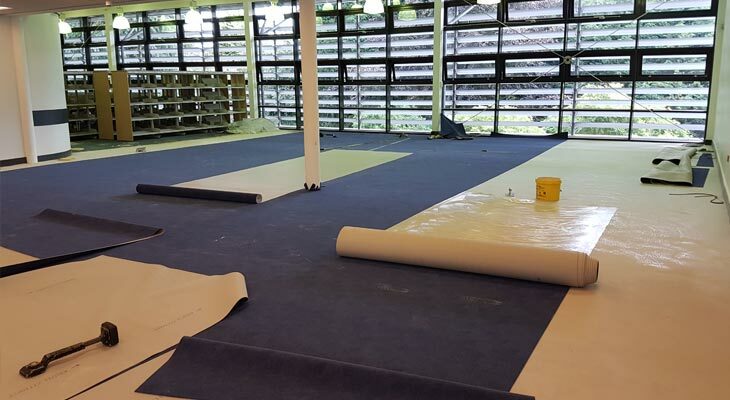 View of the new rolls of flotex carpet library flooring laid into position and then pulled back towards the middle ready for gluing out. 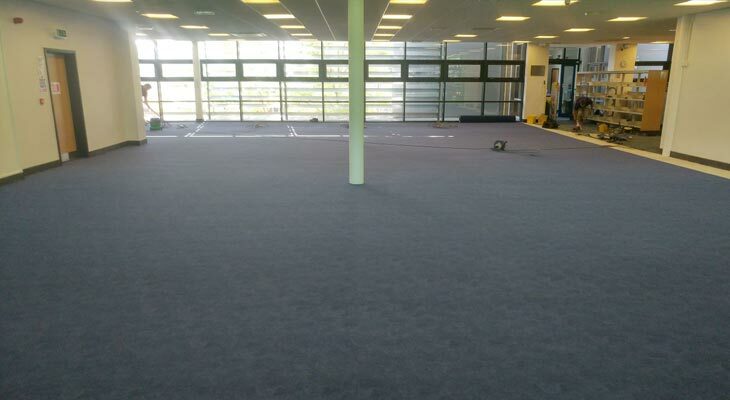 The rolls were 30 metres each and the room length was 20 metres, enabling us to minimise the number of joins required. In order to centralise the carpet and avoid slithers around the room perimeters we measured off the 2 metre wide carpet rolls and worked outwards from the centre. Given that the library room has central pillars, we planned for joins to run down their centre line (enabling cutting of the carpet neatly around them). One of our library flooring experts dropping and trimming carpet into the windows, trimming up to the window sill, then rolling back, gluing out and rolling back into the wet glue. 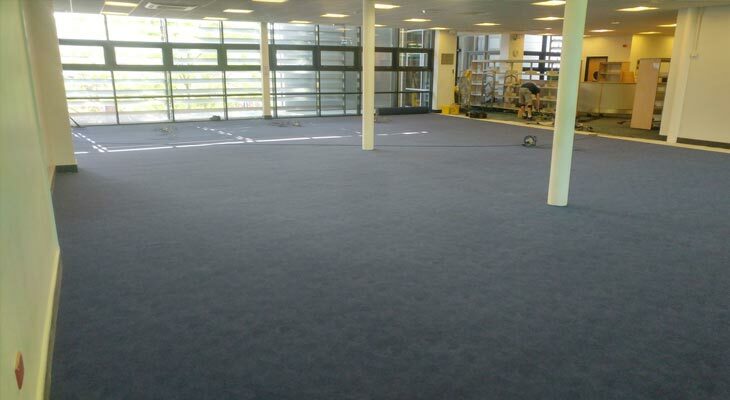 View of the newly installed super hard wearing blue flotex carpet library flooring. 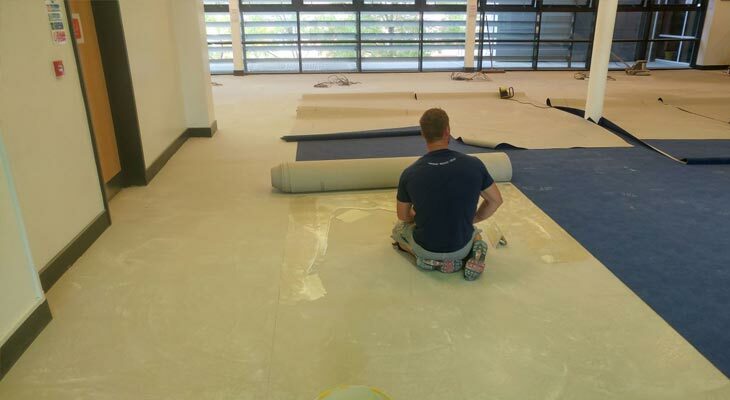 One of our commercial carpet fitters hovering around the library pillars to make everything look pristine towards the end of the commercial flooring in Godalming. 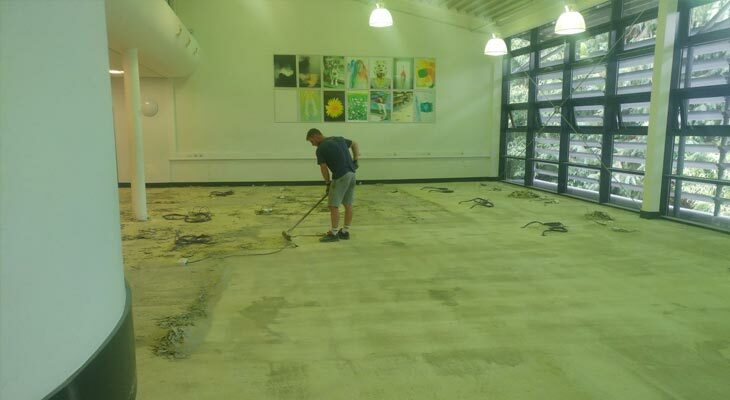 One half of the 600 square metre library flooring in Godalming completed, ready to move over and repeat the same process to the other half. Overall the library flooring works took less than two weeks to complete. If you have any questions or require library flooring installers then don’t hesitate to contact us at Euro-Pean Flooring. 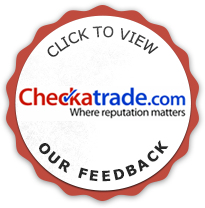 We serve customers all over the South East.